I’d like to start this review by noting that I’m not a watch expert. I admire watches, but that admiration has yet to translate into fiscal irresponsibility. (Give it time. -Dan) So take my opinions with a grain of salt, and if I get some of the technical details wrong, kindly give me a heads up in the comments. The Bertucci A-2T is the second watch I’ve owned in my adult life, and the only watch I’ve ever worn with any regularity. It was purchased for me as a gift by my family; they were haranguing me for a Christmas list, and at the last minute I saw this on a site I trusted and suggested it. To me, the A-2T was just an attractive field watch gussied up with titanium, and after two years of use…yeah, that’s about all it is. I don’t mean that in a bad way, mind you. I’ve worn this watch day-in, day-out for nearly two years and it’s still ticking. Every so often I’ll include the A-2T in a shot on Instagram, and enough people have asked me my thoughts on it that I figure a review is appropriate. In light of that, I decided to do a little more digging into Bertucci, and came away with a few chuckles. Originally, I was going to make a number of unkind jokes about their marketing department. The “Our Story” page of their website is, at first glance, unrepentantly pretentious. Keep scrolling down and I think you’ll agree that they’re more self-aware than I first gave them credit for. The case of the Bertucci A-2T is 40mm wide, 13.5mm thick, and weighs 54g (1.9oz.). It’s constructed of a single piece of titanium, which is imported from China but machined here in the U.S. One of the selling points (that I didn’t know was a selling point until recently) is the integral lugs. There are no screws or springs keeping these bars in place, which is a bit of a double edged sword. On one hand, this style of construction is definitely more durable; on the other, it limits your choice of straps and bracelets. Forgetting to take it off when hauling a collapsed ewe back to its flock and water trough. Collecting a variety of wastewater samples which invariably end up splattering truly awful liquid all over the watch. Wearing it into the mosh pit at a show, where I learned you don’t shoulder check guys bigger than you on a beer soaked floor. Innumerable scrapes and dings from changing tires, digging trucks out of mud, and general vehicle maintenance in the field. Using it at a conference to track how long I’ve been subjected to literary critiques of James Joyce. Bertucci imports their quartz movements from Japan. Quartz watches lack the panache that mechanical and automatic watches have, but in general are more accurate and require less maintenance. My experience holds up to those expectations – mostly. Although this hasn’t occurred in some time, on at least three occasions my A-2T stopped working for no discernable reason. I would set it aside for a few days, intending to send it in for warranty service, but without fail it would start back up again just before I shipped it out. As far as I can tell it’s not a common problem, but be aware you might have to go through their warranty. The dial on most Bertucci watches is fairly plain, but not minimal. Numbers are printed in arabic letters, with their 24 hour counterparts in smaller print and the date ticker replacing the “4” spot on the dial. Model information is also kept on the dial in an unobtrusive fashion. Unlike Dan’s Seiko SKX173, the lume here was sparingly applied and a tad anemic. I can generally tell what time it is in the dark, but it isn’t near as effortless as I’d like. As for the bezel…see my comments on the case? The unibody titanium design makes any additions difficult at the least. About the most I can say is that the hardened mineral crystal is recessed a bit for added protection; otherwise, the only notable aspect of the bezel is its absence. My A-2T came with a green nylon strap in the 3 ring Zulu style. It’s worn comfortably these last two years and isn’t the worse for it. I only recently discovered that I’ve been wearing the damn thing incorrectly most of the time; it turns out the brackets go on the side of the wrist, not the underside. The only complaint I can register about the strap is the smell. I wear this watch at work, and I work and live in a dry, hot part of California. This strap has absorbed a fair amount of sweat, and despite regular laundering I can’t get the funk out of it. I can’t register any complaints about how it wears on the wrist. Overall, it’s thin enough that it doesn’t get hitched up on clothing, whether I’m wearing a dress shirt or a fire resistant jumpsuit. I’d imagine it might get bulky if you have to fold the strap over itself a few times, so this may not be as svelte for those of you with smaller wrists. That said, there are enough aftermarket straps in the NATO style that a replacement is easily acquired if necessary. Of course, no product exists in a vacuum, and it seems like everyone has a field watch these days. The strongest competitor to the A-2T is likely the Seiko SNK series. They’re not in the same price bracket (the Seiko falls at about half the price) but the Seiko line up does reign supreme as far as entry level field watches go. As this is the only watch I’ve consistently worn, I couldn’t tell you how they stack up. In the end, who would want this watch? Well, that’s a tough question to answer. It’s certainly tougher than most field watches, but is toughness a fair metric when the G-Shock exists? Especially when (and this is just my opinion) other field watches are more attractive? Ultimately, I think it does have its own niche. The A-2T falls somewhere in the middle of a spectrum that has the G-Shock on one end and the Hamilton Khaki on the other. If you need something dressier than the G-Shock and more durable than the Khaki, this watch is for you. 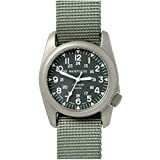 I recommend purchasing the Bertucci A-2T at Amazon. Please consider that purchasing anything through any of the links on this website helps support BladeReviews.com, and keeps the site going. As always, any and all support is greatly appreciated. Thank you very much.